The benchmark US dollar index ended the week a fraction lower at 97.34. Strength in the dollar has been building since late June but we’re yet to see the greenback reaching the highs seen at the start of the year. In March the trade weighted index, which measures the value of the dollar against a basket of six major currencies, reached a high of 100.78. 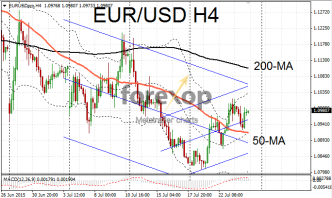 EUR/USD continues to see choppy activity without clear direction. On the four hour chart a trend which has been developing over the past week that is trying to gain a footing and push upwards. Now in a bullish position the pair is trading above the 50-point moving average. 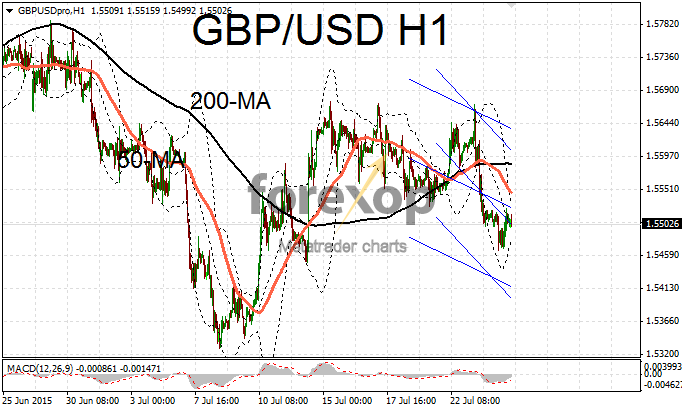 Resistance lies around the bottom of the 1.10 range while support is being met at 1.0942. 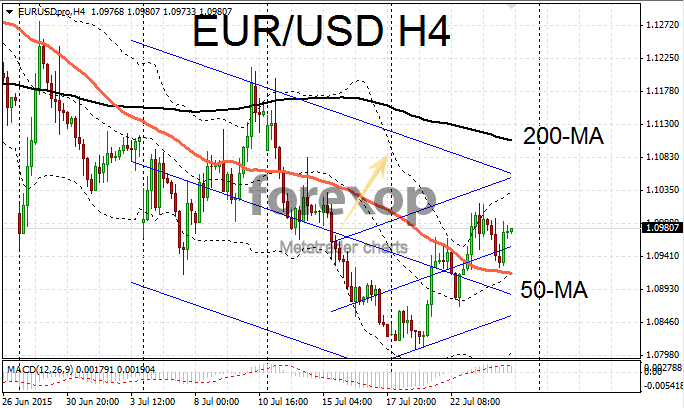 The euro was hit by weaker the expected data from the services and manufacturing sectors last week. The manufacturing activity index fell to 52.2 according to the latest survey. Services meanwhile fell to 53.8 in June from 54.4 in a month earlier. This comes as uncertainty around events in Greece is being felt across European businesses. The main emphasis for markets this week will be the Fed policy statement scheduled for Wednesday 29 July following its two day meeting. Rates are not expected to rise this time however markets will be paying very close attention to the contents of the release especially as the timing of the first expected rise approaches. US durable goods orders will be the key event on Monday. The report is expected to show that orders for long-lasting manufactured items remained static in June. The median estimate for core durable goods is for a 0.4% rise on the month just a fraction below May’s number of 0.5%. US manufacturing showed signs of revival in July according to the latest survey results from data company Markit. The preliminary or flash reading for July was 53.8 beating the expectation of 53.6. More importantly the data showed the second monthly gain in a row. This comes after the four preceding months showed steep declines after the US experienced a tepid first quarter. New home sales were a little soft in June. Sales of new homes dropped to 482,000 units in June against an expectation of 546,000. Cable eased back on Friday as poor consumer data continued to tilt sentiment towards the bearish side. The strong run GBP/USD seen during the past month is still unwinding and the current level indicates a retracement of around 62% of that rally. Yen meanwhile strengthened on an IMF report sending USD/JPY lower to 123.88.